Property horror stories happen to even the best investors. Today we detail Ben’s latest horror story and how he’s handling the stress. Sometimes, when you invest in property, it goes horribly, horribly wrong. And today, we have a horror story. Ryan: I’m Ryan from onproperty.com.au. Today’s horror story is about Ben. You guys know him. My old buddy, my buyer’s agent of choice. 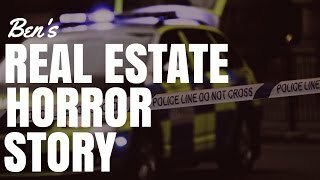 He’s had a lot of success in property, but horror stories can happen to the best of us. You guys may have heard about the Frankenstein house. If you go back with us a few years, you’ll hear about this property that Ben had troubles with in the past in terms of council requirements and things like that. It’s a bit of a hodge-podge house. Where do we begin? I’ve only heard half the story. So, I’m really excited to hear the other half and we thought that we will record it for you guys. So, take us back. When did you buy this property and let’s go into these issues. Ben: This story started for me. The Frankenstein was the second property that I bought. It was on the Central Coast. It was a 5-bedroom, 2-bathroom home with a granny flat. When I bought it, upstairs, downstairs and the granny flat were all rented out. Obviously, I realized very quickly that was completely illegal to do that. And so, that’s when the saga begins. This is was what? 7 odd years ago now or so. Ryan: That’s not a call you want to receive. Ben: The footage was from a crew on the ground and a helicopter type thing. Just to set the scene for where this is going. I’ve called my property manager and she’s like, “Yeah, I was going to call you. Something’s come up.” Effectively, the Saturday before I got the call, some police were called to the house because apparently, there was 2 illegal tenants living there that actually had a knife fight. This is how it started. I’m like, “Where are we living now? This is a knife fight.” They’ve had a knife fight and they busted up some windows and the neighbors have called the cops in and the cops have come in and must have seen some other sketchy stuff. These cops have effectively gone to the end of the property and couldn’t because the granny flat’s on fire. So, they’ve called 2 fire engines. They’ve come out, put the fire out and then, they’ve sectioned off the street. The cops have gone into the property and there’s 8 adults living in the house, apparently, heavily drugged up – let’s just say that. They’ve all gone running and the police have managed to catch 4 of them. So they’ve got them in handcuffs next to the cop car. I didn’t realize, but the neighbors have all been in conflict for a significant period of time, apparently. My property manager has never told me any of this stuff. Obviously, something has been going on that we had no idea about, effectively. Basically, the guy is in cuffs and one of the neighbors gets a fence paling and another one gets a cricket bat and they start attacking people. They’re completely cuffed up and the cops have had to call for backup. All of a sudden there’s 15 cop cars and 40 policemen there and everyone in the street has now begun fighting police, fighting the tenants. Like, just a full-blown riot. And that’s where you heard up to, right? Ryan: Yeah, that was basically it. There may have been some manufacturing happening in the house. Ben: Apparently, they found 8 industrial-size heaters or something like that in the granny flat and some illegal electrical works that had been put in there. I didn’t want to ask too many questions because I just don’t need this in my life. That’s where the story sort of I thought would have started and ended. We’ve got an insurance claim on the granny flat to be, hopefully, reimbursed for the damage that these things caused. Ryan: Is the property now vacant? Ben: Yeah. I said to the property manager, “Now, what?” and she’s like, “What we need to do is we need to kick the tenants out, obviously, straightaway.” So they’ve gone through tribunal and they’ve asked for 10 days. During this 10-day period, this is where it just continues on. Firstly, it’s the Easter long weekend and the electricity company has turned off the power and won’t let it be turned back on. There was a woman and a young girl in the property and we wanted them to have power for the weekend. But, they wouldn’t legally turn it back on. So she’s gone to the next door neighbor’s house with an extension cord and plugged into their power point and ran the extension cord in the rain across her front yard, over the fence, plugged into another couple of cords and then into the house to have power. And then, it started to rain and the owner next door has called up the property manager saying, “The extension is being plugged in. I’m just going, “Oh my God! Their house is going to burn down. What the hell is going on?” We effectively cut the power and told her that you can’t do that. And then, they’ve gone to tribunal, asked them to leave. They’ve got 10 days to leave the property. During that 10 days, the police were called on another 2 occasions for knife fights. Like, another 2 occasions for knife fights and then, 4 cars had been stolen over that 10-day period and then dumped in the front and the backyard and partially driven into the house. Like, into the house. Ryan: Into the house? Like, through the walls? Ben: Into the house. Through the front wall/window. They finally got them out of the property legally. And I’ve said, “Can you please go and have a look what’s happened?” She walks in and she rings me while she’s over and she said, “Ben, they’ve basically completely destroyed the entire inside and almost outside of the house.” over that 10-day period. There wasn’t a window that wasn’t broken. Every single wall had holes in it. Kitchen’s completely stuffed. Carpets need to be replaced. All the lights had been smashed. The house is an absolute write off. This is my life for the last 3 weeks. Two insurance claims later, I’m just waiting to see what happens. I don’t even know what’s going to happen. But, you know, welcome to the world of property investing, Ryan. Ryan: As you can see, no matter how much preparation you have or how many years experience you have, sometimes, things just throw you. Stuff just happens that’s completely out of your control. Sometimes, you get bad tenants that you didn’t know were bad in the beginning. And then, it’s just becomes this ongoing saga. Ben: We thought we had one woman with a child in the property and have just found out that there are 8 adults living in the house with all 8 of them addicted to heavy drugs. This is a suburb that is not bad. It’s not great. Ryan: It’s not a great suburb, but it’s not terrible, either. Ben: It’s not the worst suburb in Australia and it’s not the worst market in Australia, the Central Coast. There’s plenty of families there. Properties still sell. Properties have gone up in value and the rental yield is good. But, it’s kind of like, you never know what you’re going to get with this stuff, do you? Ryan: So what lessons have you taken away from this? Obviously, you’re still going through the debacle of the insurance claims and all of that sort of stuff, which is going to take time. But, please tell me you had lender’s mortgage insurance. Ben: This is it, man. I had lender’s mortgage insurance for the malicious damage claim. Which is so violent and I actually only picked up for the first time about 2 years ago because I realized the value of it. And then, I had building and contents, obviously, for the house and the granny flat, for the fire. That was kind of cool that we were covered. But, you know, there were 2 different insurance companies. One that specialized in the landlord insurance side and another one that specialized in building and contents. Yet to put a claim in with either company before, so I don’t know what the hell is going to happen, to be honest with you. But, the big thing that I learnt is that you don’t know what you don’t know. I probably paid a lot more attention to the property management reports that were coming through every quarter for the last 12 months because the property was deteriorating in condition. But, I don’t know if, looking back now, I probably could have. Ryan: Have you looked at the reports? Ben: Not really. But, I could just a gradual wear and tear deterioration of the property over time. So, there’s a pretty big lesson there to make a decision even though I was going to lose short term cash flow, to clean it up a little bit, get some superior tenants in and then continue to move on. Ryan: Well, I wish you the best in this ongoing saga. Hopefully, the insurance claims go well and you can rebuild that granny flat and fix the house, all the walls. Sounds like there’s a lot of work to do. Ben: To be honest with you, man, I’m renovating it and then selling it. I’m done with it. I’ve just had 7 years of stuff. The property has done very well. It’s time to renovate, sell it and move on. Because I just can’t see, more than anything else, all this stuff aside, sometimes stuff happens and you can’t control it. I just focus on moving through it as best you can. But, the reality is, I can’t see how this suburb with an average income of $1,000 a week is going to be worth $1 million in another 10 years’ time. And so, as per my own advise, it’s time for me to exit that market and reinvest somewhere else. Ryan: Yeah, and hopefully, just something with less headaches. Because as you grow in your investing career, it’s less about making every single dollar you can and more about making dollars with less effort as possible. Ben: 100%. I’ve learnt that lesson earlier. Obviously, 5 of my last 6 investment properties have been brand new or less than 2 years of age. Like, I learnt that lesson around high quality properties, high quality suburbs attract high quality tenants as well has higher resale values in the future. Ryan: Yup. Well, I hope this encourages you guys. I don’t know what to say. It happens. It happens to the best of us. I’ve heard a lot of horror stories. I’ve read a lot of horror stories. People get through it. Like, my mate had a place in Adelaide and, unfortunately, for some reason, all the copper piping for the place was actually on the exterior of the house rather than inside the walls. And I swear, it got stolen like 3 times. Like, the whole plumbing in his house just got completely stolen from the outside because the property was vacant at the time or something. And he had to go through all of these debacles as well. Ben: Is it in WA? Ryan: No, this is in South Australia. Ryan: You learn from it. You move on. You get stronger as a result. What doesn’t kill you makes you stronger. We’ll leave it there. Ben: Yeah, we’ll leave it there. Ryan: Alright, guys. Until next time, stay positive.